This was due to be posted weeks ago, but it never did apparently, so without further delay…. Because I don’t know when to stop apparently, I picked up two more boxes of Diamond Kings. The newest, a 2016 box was okay. The other though, another 2015 box(5th for those counting at home) that while not as nice as the Babe Ruth box obviously, was still pretty nice! The formats between the years are pretty much the same. In 2016’s set I think there’s an extra insert type or two, but you’ll end up with similar results overall. First up, the new hotness, 2016 Diamond Kings. For me, it’s always nice when the first card you see of a new box is a Twin. In this case Miguel Sano’s rookie card #143. Not bad. Each box promises two autos/relics and I received as much. 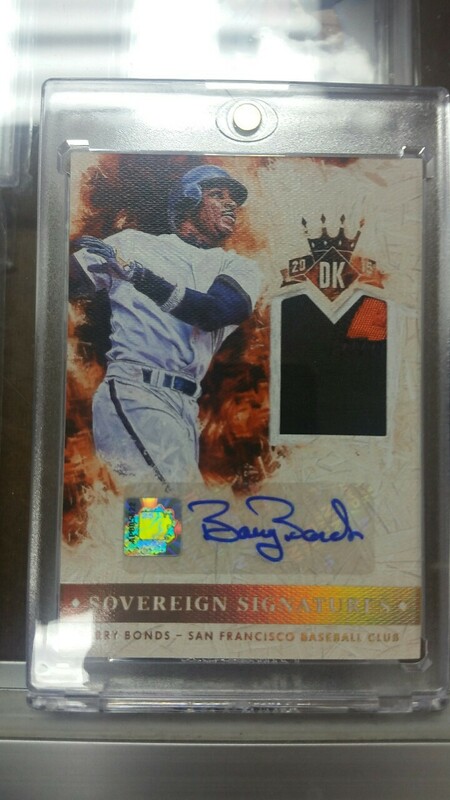 I even pulled a #/d auto/relic, not a guarantee. The insert I loved the most was one of the new set this year is the “Expressionists”, they just have a very unique look to them. That Addison Russell is especially sweet with the t-shirt and his….expression. 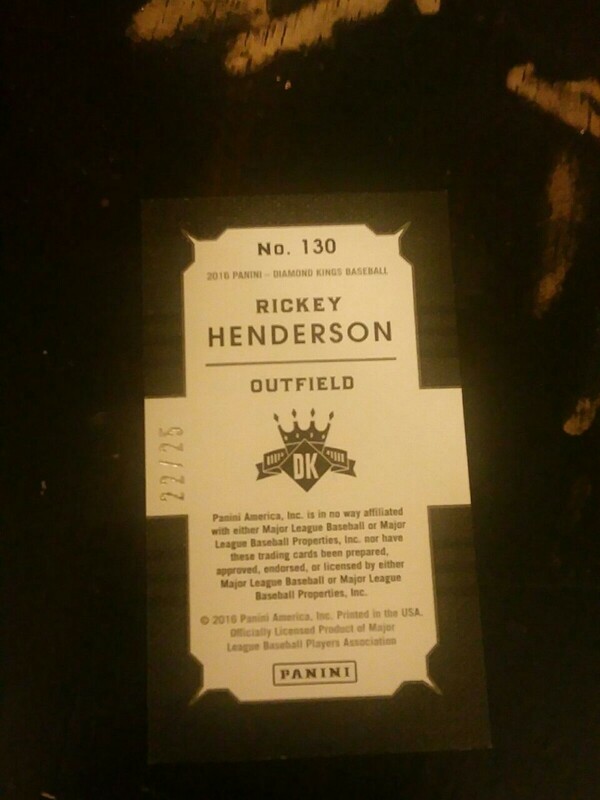 A first for the boxes I’ve pulled, one of the minis was numbered – Rickey Henderson. Last year’s base cards that were numbered received a different foil Diamond Kings logo, which I liked, but this years design – at least from what I’ve seen adds extra foil to stand out(see the Artist’s Proof on the Andrew McCutchen?). Overall not too bad, but I prefer 2015 for obvious reasons – Ruth, and the box below. Edit: I didn’t know there were short printed cards until I went to post this, seems 2015 has them too. Separate post? Probably. 53 – 1-140 Base cards. 24 – 141-185 Rookie cards. 2 Short prints – one base(#17 Roberto Clemente), one rookie(#145 Stephen Piscotty). 2 minis – #110 Yasmany Tomas, #130 Rickey Henderson #22/25! 1 Artist’s Proof – #56 Andrew McCutchen #69/99. 2 Expressionists – E15 Kris Bryant, E17 Addison Russell. 2 DK Originals – DKO13 Cal Ripken, DKO15 Nolan Ryan. 2 Heritage Collection – HC11 Gaylord Perry, HC13 Jim Palmer. 2 Aficionados – A15 Jacob DeGrom, A17 Todd Frazier. 2 Memorable Feats – MF15 Gil Hodges, MF17 Nap Lajoie. 2 framed cards – #108 David Price, #158 Zach Davies. Now for the fun stuff. 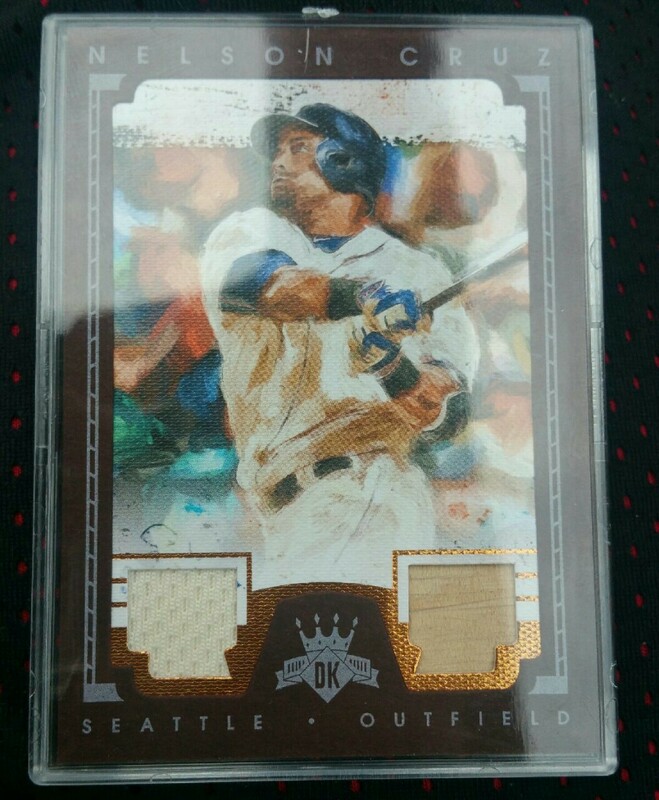 The first hit I pulled was a Nelson Cruz jersey/bat relic #35/49. The design this year for the base cards really shows off in the framed relics. An improvement, and definitely nicer than some of the flagship/base relic designs we’ve seen in years past. I didn’t know he had moved onto Seattle so the card threw me for a loop for a second. I almost offered it to the shop owner, as living in Texas, a Cruz relic would’ve sold relatively easy. I just don’t keep up with transactions like that anymore. For this year’s Topps Heritage I didn’t know who John Hicks was, I thought they had made an error and meant John Ryan Murphy – another offseason transaction. My bad Mr. Hicks. 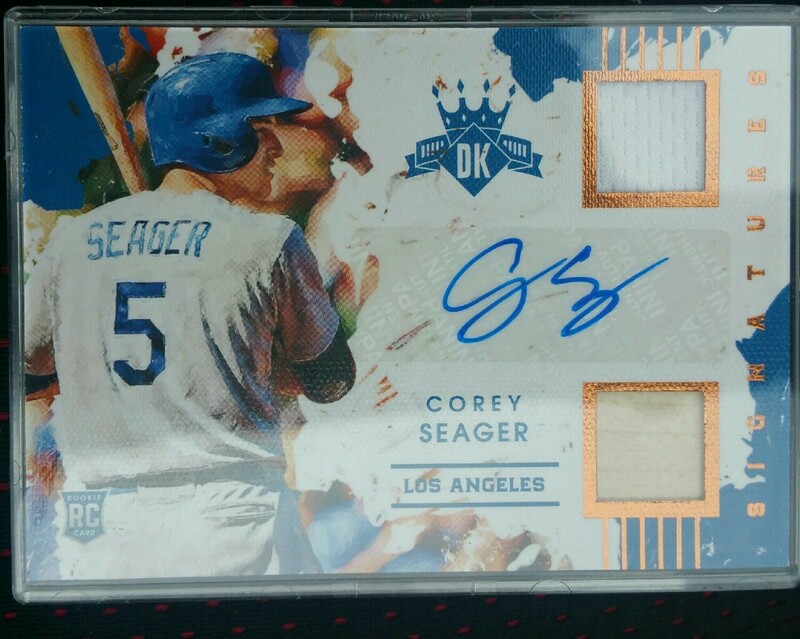 My second pull was pretty sweet, a Corey Seager #11/99 jersey/bat/auto. With a clean, crisp autograph, a nice window and the numbering on the back of the card doesn’t distract from the overall design. It’s never a bad thing to have a potential rookie of the year card like that. Logo be damned. 2 Short print rookies – #155 Christian Walker, #179 Rymer Liriano. 1 #/d base card – #118 Rogers Hornsby #47/99. 2 Hall of Fame Sluggers – #16 Duke Snider, #18 Johnny Bench. 2 DK Originals #3 Clayton Kershaw, #18 Yadier Molina. 2 Nicknames #3 Mariano Rivera, #18 David Ortiz. 2 Aficionados #3 Clayton Kershaw, #18 Yadier Molinda. Yay collation! 2 framed base/rookies – #22 Cal Ripken, #82 Jon Lester. 2 Minis – #23 Carl Furillo, #104 Miller Huggins. I like that Panini created mini relics that stand out and hold up well on their own without needing to be framed. But man are they ever a pain to store! 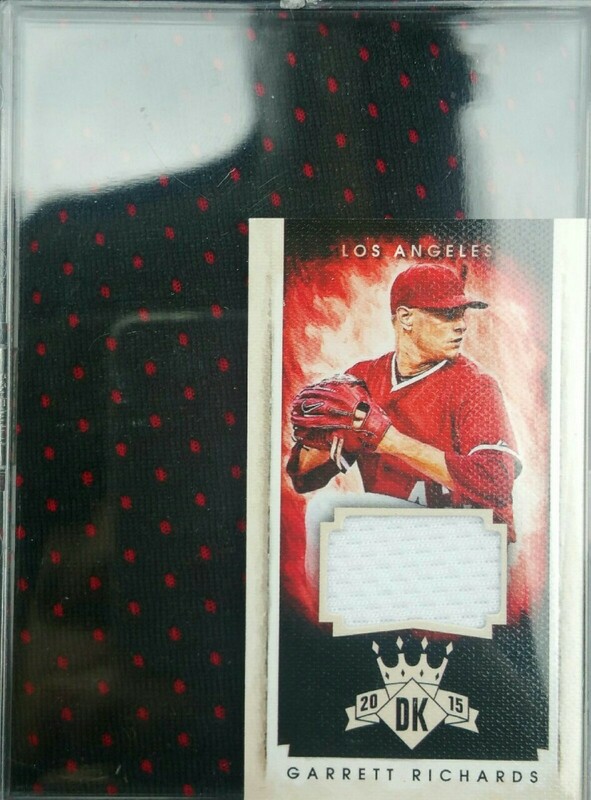 I pulled one in this box, a Garrett Richards, #42/99 jersey relic. 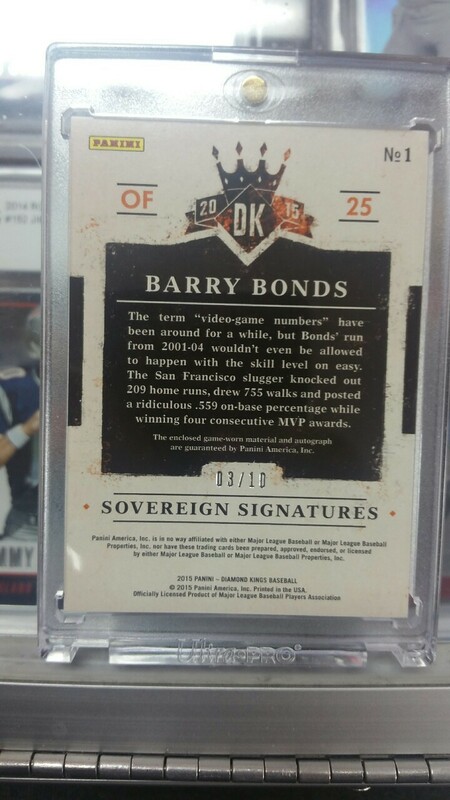 …a #3/10 Barry Bonds relic/auto! 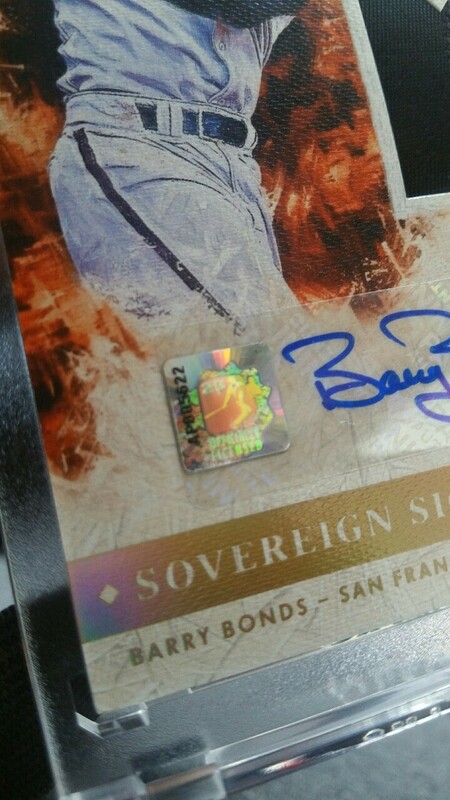 I love that Barry Bonds has his own authentication stamp. I looked at a few that were posted on ebay, theirs had two relics, but were smaller than mine – a “jumbo“ relic, maybe? Plus it looks like I’ve got a bit of the Giants logo, or the name plate on the back. Very cool relic Panini! In the span of two weeks, I’ve pulled two of the top three home run hitters of all time. Not too shabby, a shame they don’t have a Hank Aaron in the set. :D.